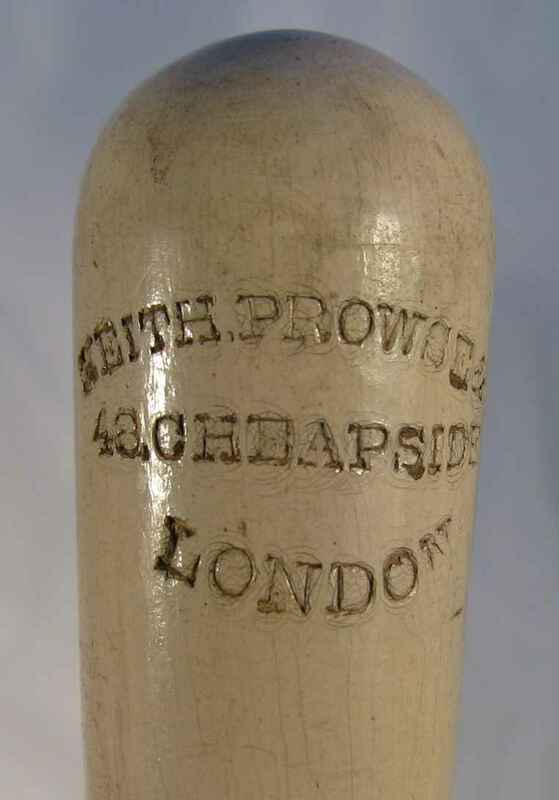 Full Description: A conductor's baton, stamped with the name "Keith, Prowse & Co, 48 Cheapside. London". 563 mm long, this is one of the many items sold via Keith, Prowse & Co's Cheapside shop; they marketed and badge-engineered concertinas from several London makers, published many selections of concertina music, and may even have commissioned their 'own make' of concertinas. Keith, Prowse & Co. were a company that traded under variations of the name, and took over the concertina maker William Doveabout 1852. Mr. W Prowse, who ran the company from 1846 to 1865, is shown in the Wheatstone Sales Ledgers to have purchased 16 concertinas from Wheatstone during 1851, so the firm was already established as a concertina trader before their takeover of Dove. By 1888 they were selling rebadged Lachenal instruments from their 48 Cheapside, London premises. The Collection has several Wm Prowse and Keith, Prowse-labelled/manufactured instruments: See C.251 and subsequent instruments.